Lesley Smith, Jackson Fowlow and Robin Hebb in I’ll Be Back Before Midnight! Summer in Nova Scotia is the perfect time to embark on a magical mystery tour, theatre-style. 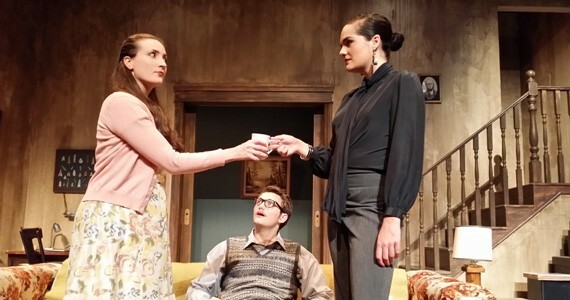 Head to the Annapolis Valley and take in three delightful, chilling and thrilling plays. The Tempest (Ross Creek Centre for the Arts), as adapted by Ken Schwartz, is touching and wonder-filled, anchored by a layered performance by Graham Percy as Prospero. The production focuses on Prospero's transformation from a man fixated on revenge to one willing to forgive. Jamie Konchak as the spirit Ariel is part wild thing, part mischievous child and part something otherworldly. Her relationship with Prospero is complicated and quite lovely. It's hard not to tear up as Ariel flies to freedom without a backwards glance. The clowns are pure delight—Marty Burt as the loathsome Caliban both repulses and pulls at your heartstrings, Jeff Schwager and Ryan Rogerson make excellent drunken buffoons. The sweetness of the betrothal plot is played perfectly by Andrea Lee Norwood and Charles Douglas. As the scheming royals, Burgandy Code, Sarah English and Chris O'Neill ooze pure ice and venom. Gorgeous costumes by Jennifer Goodman and whimsical driftwood puppetry add much to the experience. A darkening summer evening at Ross Creek is a magical time in a magical place, Shakespeare's The Tempest is a play filled with sorcery. Put them together and you have pure enchantment. Also at Ross Creek, The Turn of the Screw stars Burgundy Code as a devoted governess whose young charges (Norwood and English) seem to embody sweetness and light. However, the presence of ghosts in the out-of-the-way country manor reveals that all is not what it seems. The novella itself allowed for ambiguity in the tale (are the ghosts real or a figment of the governess' imagination? ), but in this retelling, the ghosts, who sit and move around the campfire, are as real to us as they are to her. The campfire setting at Ross Creek lends itself well to scary tales, but as ghost stories go, Henry James' gothic tale is more strange and unsettling than scream-out-loud frightening. I'll Be Back Before Midnight! (Al Whittle Theatre) is a play that sets out to be pure entertainment, and succeeds. Set in a creepy farmhouse (perfectly realized by set designer Katherine Ryan), it tells the story of a young woman named Jan (Lesley Smith) who has moved to the country with her husband (Jackson Fowlow) to recover from a nervous breakdown. Jan's already-frayed nerves are pushed to the breaking point by a garrulous neighbour (a very funny Jeremy Webb) with a penchant for ghost stories and by a visit from her smoothly poisonous sister-in-law Laura (Robin Hebb). Shortly after Laura arrives on the scene, unsettling things begin to happen. The question becomes, is Jan being driven mad, and if so, by whom? I'll Be Back Before Midnight! is billed as dark comedic thriller. It offers some squeal-out-loud moments, but ultimately it's a campy whodunit fueled by plot twists so intentionally ridiculous, you can't help but laugh.